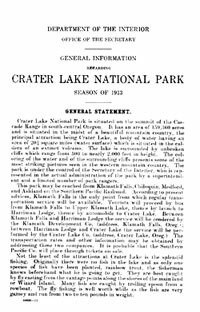 Whichever name you give it, from the early days of the National Park Service there was a recognition of the need to provide information to park visitors as an aid in getting the most of one's visit to our National Parks. The earliest park brochures were produced annually, consisting of multi-page booklets that gave a brief introduction to the park, rates for lodging and transportation services within the park, and rules and regulations. A color map was eventually added in the center and more information about the park and its notable features were added to help expand the park visitor's understanding and appreciation. Over the ensuing years park brochure designs evolved into many different formats. A need to reduce printing costs resulted in a switch from guidebooks to to a smaller pamphlet format, which came in many different sizes and, in time, colors. Since 1977 the designs of all new brochures have been based on the "Unigrid System" format, created by designer Massimo Vignelli in collaboration with Harpers Ferry Center's design staff. A modular grid system for layout of text and graphics, black bands at the top and bottom of the brochures, and a standardized typeface are the defining features of the Unigrid system. Standard map formats complete the presentation, helping to establish a uniform identity for National Park Service brochures. Today, the official park brochures are known for their reliability, thoroughness, visual appeal, and standard design elements that contribute to the National Park Service graphic identity. As park visitation increases and personal services decrease, the onsite portability of publications gives them a significant role in providing visitors with interpretive, logistical, and safety information. Publications are also the one interpretive medium visitors can take with them as a souvenir and handy home reference. In the Web pages that follow, our aim is mostly to illustrate brochure covers of selected parks to illustrate the evolution in design of the many styles that have been produced over the decades, up to the implementation of the Unigrid design in 1977. Since professional photographers have been employed in producing the cover image for current park brochures; these covers are being shown solely for educational purposes. For selected years, the actual contents of the brochures can be viewed on-line (look for the titles with links under the brochure covers). Additionally, the National Park Service has produced a number of Handbooks and "Series", covering topics ranging from Archeology to History to Urban Ecology. You're invited to visit our Handbooks and Publication Series Web pages for a view of other interpretive media the National Park Service has produced over the years.